In case you have come to the decision to buy your child a boat they can truly enjoy on the water whether, at the lake, pond or even in the backyard pool our picks will surely help you. It can be a truly exciting experience for kids, so it’s important that you choose the right one. The best remote control boats for kids have a number of features that we weighed when coming up with our top 10 list, like being easy to control, durable, and having a good battery life. We weighed those and more when evaluating the products on the list below. Takes a bit to get used to the controls. Some customers might get defective products. Recommendation: First up on our best remote control boats for kid list we have this remote control boat that comes with a large-propeller and a durable anti-flip design that is so easy to control both for kids and adults alike. Customers say they love this fast and fun little boat. 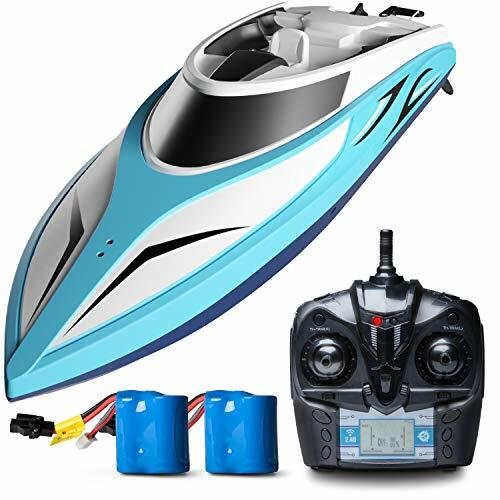 Be careful that this remote control boat should not be used in salt water, it is for freshwater use only, and it is best to be used in lakes due to its wide range. Can float back up automatically. The tail portion can fill with water. Recommendation: A simple toy for kids to play with in water is this cute submarine. It’s small enough for any child to carry, and it can even fit in the bathtub. It submerges with ease, and it even floats back up automatically if the batteries are draining. If it goes too deep, it’ll lose the signal though. This may not turn left and right as smoothly as others either, but it provides up to 20 minutes of playtime. Variable speeds you can adjust. Propellers aren’t always fully submerged. Recommendation: One of the best remote control boats for kids acts as a fishing boat too. Head out to the lake for some fun fishing time with your kids. It’s durable enough to hold onto fishes of various sizes, and you get total control of both the boat and the lure. The fishing boat itself can be hindered as the back doesn’t always submerge completely. Try not to let this go too far as the battery life is short as well. Struggles to move in a straight line. Recommendation: The Missile Stealth Speed Boat can certainly reach some high speeds. There is a lack of variety in the speeds, however, as it’s either going full-on or not going at all. Even so, the boat is easy for kids to maneuver. There’s a nice safety feature when the boat’s out of the water as the propellers refuse to move until it’s back in the water. 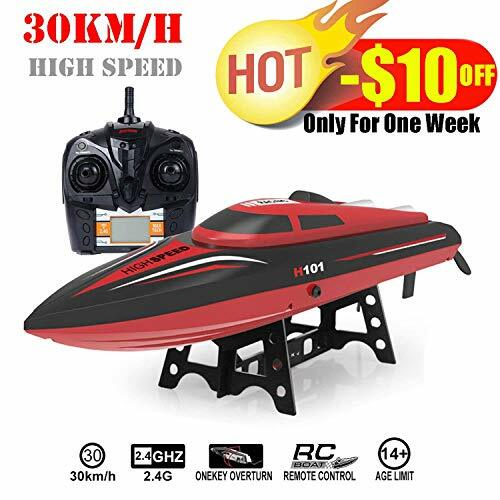 It’s a great RC boat for beginners, and it might sell with free shipping. Can be prone to flipping upside down. Might be too fast for younger kids. Battery life could be longer. Recommendation: This powerful, fast boat can have your kids surpassing any other boat on the water. Although some younger ones may have issues with the speed, it remains relatively easy to control. Turning is practically seamless. It has a number of features to keep the boat reliable and ready to use. For instance, the inside remains dry and the battery is always protected from water and overcharging. Tough to control in small bodies of water. 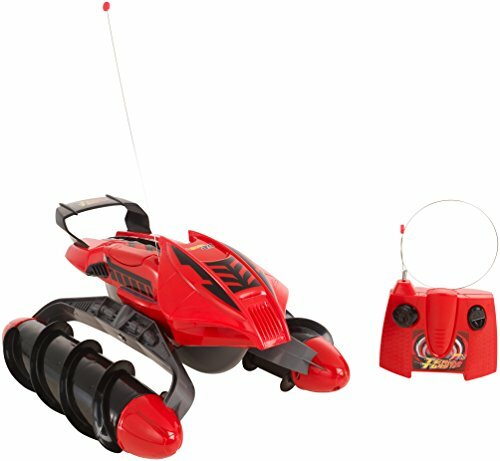 Recommendation: If you’re searching for one of the best remote control boats for kids that they can enjoy racing their friends with, then try out the Venom Boat from USA Toyz. This reaches great speeds, making them perfect for use in lakes and ponds. They’re easy to use, but controls like turning can get tight in smaller areas such as pools. However, it does self-corrects if it flips over. Recommendation: This is a remote control boat that can work best in ponds and pools. It doesn’t move fast, and reversing is almost nonexistent. However, the control can stretch out incredible distances, and the boat is highly resistant to damage. Although it can flip over easily, it has a self-righting hull design so your child never has to worry. If your kid loves remote control toys, you can also look at our best remote control helicopters for kids list. Multifunctional (can be used on water or on the ground). Doesn’t go forward or backward smoothly. It can get too wild and start gliding around. Recommendation: The only one of its kind on our list, one of the best remote control boats for kids is this hybrid, all-terrain ship. It’s a boat meant to tackle all seasons: take it out in the water for some incredible boat racing, or use it on the ground to get through other obstacles. Your child is in for quite a deal of fun, however, it could use with some more easy maneuvering as it can get too fast sometimes. Not a lot of runtime. Recommendation: The Rabing F1 High-Speed Boat is most certainly fast enough to entertain any child. With its speeds, it may work out best in larger bodies of water as a pool doesn’t allow it much turning room. Watch out for water slipping in as it turns. Controls and maneuvering are simple enough even for younger children. The battery life isn’t that long, but it does come with an easy charging setup. Perfect size to operate by children. Takes some time to charge. Recommendation: The first thing kids may notice about this is the handy LCD display on the controller that provides additional, helpful information such as battery life. It has a great distance to it so kids shouldn’t worry about driving further out. The battery is not that good though, so keeping an eye on things through the controller helps. 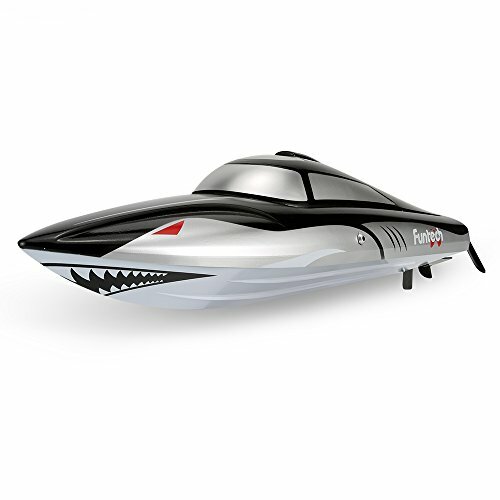 One of the best remote control boats for kids features great waterproof functionality to keep it lasting long. You can find this high-speed boat shipping out free. It also works for adults. Might be too powerful for a pool. The battery only lasts 30 minutes. It starts to work only after it is on water. Recommendation: This little toy is made only from high-quality materials and has a high-power motor that comes equipped with an excellent water cooling system and high-torque steering servo. Moreover, it has double-hatch protection for better water resistance, low-battery warning, a durable anti-flip design, and an LCD display on the controller that shows the battery level and signal level indicators. Designed to be safe for children. Battery life is not sufficient. Fast turns can cause some leaks. The controller is a bit low-quality. Recommendation: To wrap up our countdown of the best remote control boats for kids, the Blexy remote control boat has a super sleek design to catch and hold your child’s attention. It has a wonderful amount of speed to it, and it can recover easy enough if it capsizes. The water sensor ensures that kids won’t hurt themselves on it prior to getting it in the water. Although the controller features an LCD screen, it feels a bit flimsy. Also, the boat may need a battery upgrade to last longer. Our extensive search and review of these ten products made us certain we discovered the best remote control boats for kids. Buying these fun, safe water toys for your kids is sure to excite them. We would definitely take the GordVe for a spin ourselves, as it is our number one pick! We’re interested in hearing your thoughts and experiences with remote control boats, so don’t hesitate to share your stories.